Using spices in the kitchen makes cooking fun, exotic, and definitely ups your kitchen guru skillz. There are plenty of articles out there trumpeting the use of spices and herbs in cooking without the added artificial chemicals or artificial flavorings that processed food manufacturers tend to add, but what stopped me from using spices in the past was confusion - I didn't know about specific food to spice ratios and which spices would best complement different foods. 1. Don't be afraid to mess up! Hockey legend Wayne Gretzky once said "You miss 100% of the shots you don't take". Many folks starting out are worried about messing up in the kitchen, but you won't get better if you don't try. Austin is pretty intrepid in the kitchen so that encouraged me to experiment. Even if your dish doesn't turn out great, many spices offer a lot of health benefits, so try to enjoy your healthful meal and make notes of what to change next time. One of Ubuntu Fitness's happy places is the bulk bin at Whole Foods Market. My recommendation for a spice and herb newbie is to start here - you can buy any quantity you need without having to commit to a large shaker-size of something you've never tried before. Plus, this saves $$$! Who doesn't like that? In comparing he price of spices in the bulk bins to packaged spices ($/oz vs. $/oz) the bulk selection just about always wins, and by a lot. For example you can see in the picture of Mexican Seasoning Blend I have posted that the bulk price is $0.69 per oz. A jar of that same seasoning goes for $4.89 for 2 oz! That's over 300% more expensive per oz!! The bulk bin offers affordable, fresh and fun mixes like Cajun Seasoning Blend and the Organic Pizza Blend we use in many different meals, even chopped veggies pan-cooked in plain water. 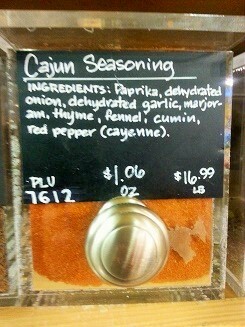 Some easy and super versatile ingredients to start with: garlic flakes, Cajun Seasoning Blend, cinnamon, curry. Herbs and spices have many health benefits, so why not use a combo for your food? Fenugreek tastes sweet while curry has a more savory flavor. Flavor favorites such as Cajun and Muchi Curry are actually a combination of multiple spice ingredients. Curry contains turmeric. Turmeric contains the compound curcumin, which gives the spice its yellow-gold hue. Curcumin is a potent anti-inflammatory - it's been studied in various disease states such as osteoarthritis, and one study links it to slowing the spread of prostate cancer (1). Cinnamon and to some extent fenugreek are shown to lower blood sugar in diabetics (2, 3). The combination of cinnamon and ground Stevia leaves, a plant (think mint) add sweetness to foods or beverages without added sugar or calories. From experience, this layering effect of mixing spices adds a more interesting flavor profile, which is important for making food taste unboring. Using just oregano over sauteed veggies can still taste bland, in my opinion. This may just be me, but recipes confuse me. Especially if I don't have the specific amount needed. As long as I have the ingredient, I tend to use more than what a recipe calls for of an herb or spice (baking is a different story, of course). Why? I want my food to be flavorful. Honestly, I just eyeball it. My rule of thumb: sprinkle just enough to cover most of the surface area of your food. To the left are some examples.